I was at a coffee shop with my friend Dennis on a writing date, when I saw a couple sitting together deep in conversation and if I might add, one sided. The man got up to throw his cup away and the girl immediately reached for her phone. I know it seems widely accepted at this point to be on your phone or to be doing something with your phone almost all the time, but it still seems strange to me as someone who didn’t get a cell phone until I was 18. Do we really need to be checking our phones that frequently? I know I check my phone anxiously to see if I missed a call, but in the scheme of things is it that important if we don’t respond to a text or call someone back immediately? I have even texted or talked on the phone when at dinner with my boyfriend. We both have because it has just become an excepted way of life, but it definitely says something about the demise of basic etiquette. I don’t have any new year’s resolutions but I think this would be a worthy challenge. If I just called people back when I had the time and let it go to voicemail sometimes that would be one less thing to worry about. Here is a great article my friend Jen brought to my attention. What do you think? Could people be better about this? Or should I just get used to the fact that people will one day have a phone implanted into their hand? Did you read this article?http://www.cnn.com/2008/LIVING/personal/12/18/tech.etiquette/index.htmlI know some people who must be seriously addicted to checking their phones. And I\’m just amazed today at the type of situations in which people will actually answer their cell….wow! I mean, we survived high school without one, didn\’t we?By the way, I wanted to wish you a (late) Merry Christmas! Ha, I know, I\’m really late. I hope you\’re doing well! Hey! Merry Christmas! I am great! How are you? That\’s a great article thanks for the link.I am also amazed by the strange situations in which people will check their phones: movies, plays, etc. lol!!! I just found your blog and I am adding it to my reader list right now. This first post has me sold! What a great image! 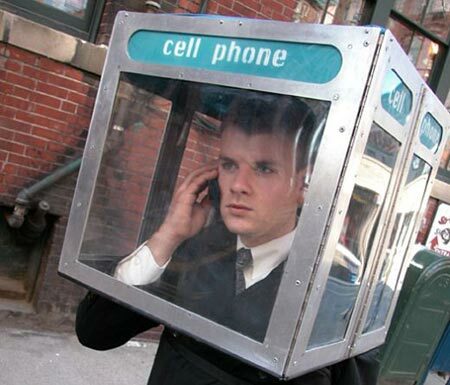 I wish I could handout little phone booths to everyone! 🙂 I cannot wait to read more! Haha awesome! I just found your blog and it is beautiful! Good! I\’m good as well, just kind of hanging around until I find a job! I started volunteering at the Holden Arboretum in the development department until I get this career planning stuff sorted. I\’ll be out of town for a week, but when I get back we should get together. That sounds good. Give me a call!